The Rokinon 8mm f3.5 fisheye lens is on sale for $200 with free shipping in six different mounts, five SLR (C/N/A/P and Four Thirds) and Sony E-mount at B&H Photo. ++ NOTE: the E-M5 body is going to be an Amazon Lightning Deal at 3am ET on Tuesday. Note: the other E-mount cameras participating in this promotion (NEX-5T, a5000, a5100, a6000) get smaller discounts on the 55-210 and require promo codes. Woot Plus has a refurbished camera sale featuring mostly old and refurbished cameras, including the refurb Sony NEX-3 with 18-55 for $240, refurb Sony a3000 w/18-55 for $250 (limit 1) – note that it currently goes for $300 in new condition at Amazon (limit 2) – refurbished Fuji S4830 superzoom for $80, and a few other superzooms and P&S cameras (Samsung, Sony, Pentax, Fuji, JVC). They also feature Gitzo and Manfrotto tripods and camera bags and Monster brand memory cards (Dr. Dre not included! ), and these are new condition. Shipping is $5 flat regardless of how many you buy. Promotion ends on 11/1/14 at 12am CT (I don’t know if they mean 11:59pm or 12:01am) or earlier for any items that sell out. The Sony a3000 E-Mount (don’t-call-me-NEX) camera kit with the 18-55mm f3.5-5.6 kit lens is currently on sale for $300 with free shipping at B&H Photo when you add it to the shopping cart and do the login to your B&H account song and dance. 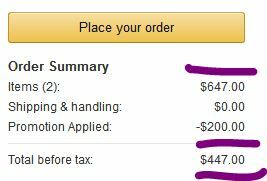 This bonus round of Amazon Camera and Photo Lightning Deals ended. The deals were worthy of their name this time! The NEX-6 w/16-50mm finally went live and it was at an even better price, $425! It was 97% claimed. So it turned out to be a good idea to wait for the Lightning Deal to finally materialize (in retrospect, it’s easy to say that). Tempted by the Fruit of the Alpha? Adorama has a new trade-in offer for the Sony a7 and a7r cameras. The offer has two legs. First you purchase one of the aforelinked Sony a7 or a7r kits. Then you receive the camera along with a prepaid shipping label from Adorama. You use that label to ship to Adorama your old working trade-in DSLR (any model, any year, any manufacturer). More details at the promotional page. You receive your trade-in discount when you place the order. The Trade-In bonus amount is factored in the prices above and it is variable depending on which model you select. Promotion ends by 12/31/14. Please note Adorama will be observing Sukkot, so factor that in the timing of your order. The current wave of eBay Deals includes the manufacturer refurbished Sony NEX-5TL with 16-50 & 55-210 and a free bag for $450 with free shipping. This is sold by Secondipity’s eBay store and comes with a 90 day warranty and 30 day returns per the eBay listing. Speaking of the eBay Deals, you can find a lot of last year’s flagship smartphones refurbished no-contract for under $250 (LG G2, HTC One M7, Moto X, etc).